This paper presents the hydrodynamic results of the two stepped planing hull by numerical software solver. Time-averaged Navier-Stokes equations are coupled with the standard k-ε turbulence model, and volume of fluid equations are solved to simulate transient turbulent free surface flow surrounding the hull by ANSYS-CFX. In order to predict the motion of the vessel, equations of two degrees of freedom for rigid body are coupled with governing equations of fluid flow. In order to validate the numerical model, the obtained numerical results are compared with the available experimental data. The numerical results obtained for drag, dynamic trim, rising of centre of gravity (CG) and the pressure distribution on the body at different speeds and different heights of the applied steps are presented and discussed. 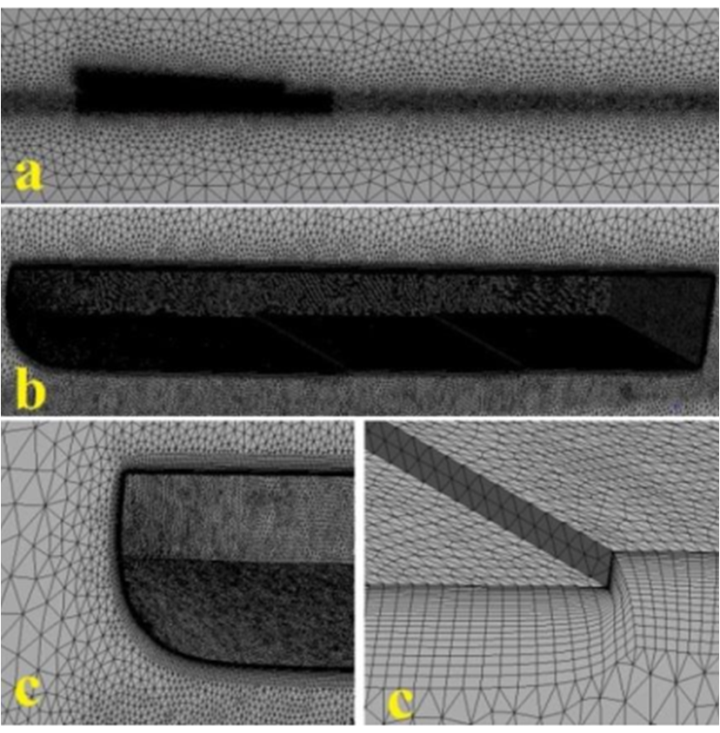 In recent decades, much effort is made by researchers to reduce drag and increase speed of planing hulls by changing the geometrical parameters of the hull. Various forms have been used so far, such as Chine, Strake, Pad, Spray rail, Tunnel and Step. Among these methods, applying transverse step on the hull is known as the most effective. It is common to create holes on the outer walls of the step for air suction. Generally, it is expected to increase the speed of vessel by 10 to 15 per cent by applying stepping method 1. The main idea of applying transverse step on the hull is to reduce the level of contact of the hull with water on two or more small planing surfaces instead of one large surface. Since the force is distributed on several surfaces throughout the hull, the longitudinal stability increases. However, despite the benefits of the transverse steps, there is also the risk of vessel capsizing if the airway is closed by the coming waves. If aeration is stopped, reverse flow occurs behind the transverse step, which leads to an excessive increase in drag. As a result, the speed suddenly decreases and the vessel may capsize. To avoid this problem, air is often sucked through the duct above the water or is supplied through pipes on deck surface. So far, most hydrodynamic studies using a variety of methods on planing hulls have been focused on the bodies without transverse steps. The process of some of these studies is provided in Table 1. Recently, according to the demands as well as the achievement of higher efficiencies, researchers have been more motivated by the use of transverse stepped hulls, and more effort is being made both numerically and experimentally to study and investigate this topic. A negligible number of studies can be found on transverse stepped hulls during the last 15 years. In Table 2, some of these studies are presented. 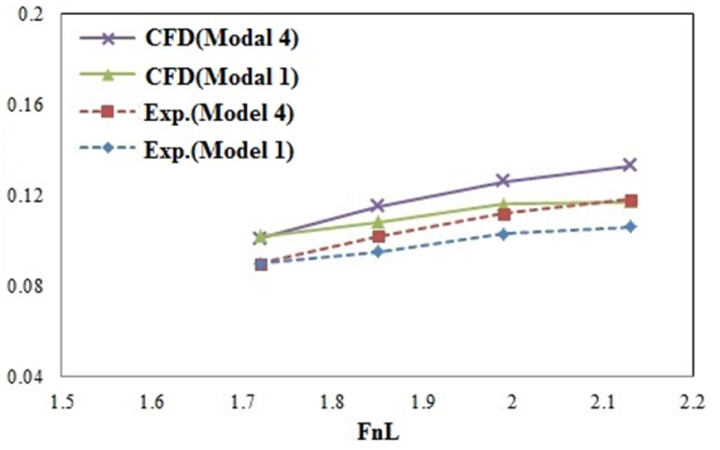 In this paper, the effects of transverse step height on hydrodynamic performance of the planing hull in investigated by FVM. For doing this, ANSYS-CFX is used. Transient and turbulent free surface flow around the solid hull is modelled by the RANS equations along with the turbulence model standard k-ε coupled with VOF equations. To predict motion of the vessel, the equations of the two degrees of freedom of the rigid body are coupled with the equations governing the fluid flow. In this paper, the planing hull has two transversal steps. In six different modes, with variable height of transverse steps, and in three different displacements, the results of the numerical investigation obtained for drag, dynamical trim and pressure distribution on the surface of the hull are compared with the experimental data. where and are constant values, and Pk is turbulence generation due to viscous forces. The present study is conducted on a model of stepped planing hull, which is known as Lee model. This model was tested in 2014 by Lee et al., and the results are available in ref. 23. The model has been tested in six different step heights (0.009525 and 0.00635, 0.003175) with specifications that are given in Table 3. Besides, all of the models were tested and investigated at displacements of 43.09, 55.38, and 47.62 kg. Geometrical parameters of the models are provided in Table 4. Besides, a two-dimensional view of the model is shown in Figure 1. The flow around the vessel can be assumed to be symmetric with respect to central plane. Therefore, calculations are reduced to only half of the solution domain. The distance between boundaries of this vessel and the body are chosen in such a way that it is possible to apply boundary conditions that are consistent with reality. Solution domain and boundary conditions are shown in Figure 2. In this study, we used the use of k-ε turbulence model. The number of inflation layers within the boundary layer is considered equal to 22. The dimensionless thickness of the first layer on the surface is Y + = 50. In order to better approximate curves and sharp corners, the cell size is considered sufficiently small on the body surfaces. 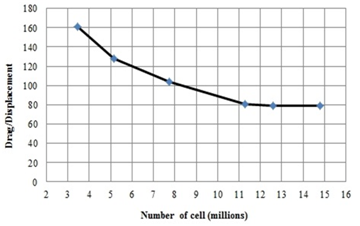 Cell sizes in the two regions in flow where high gradients are expected are considered smaller. The first region is around the free surface, where it is required to solve its shape, and the second region is a part of the first region near the body, where separation of the flow from the chine, step and water spray occurs. The computational grid generated around the body is shown in Figure 3. In order to check the grid independency, calculations are performed in several grids with different numbers of cells. 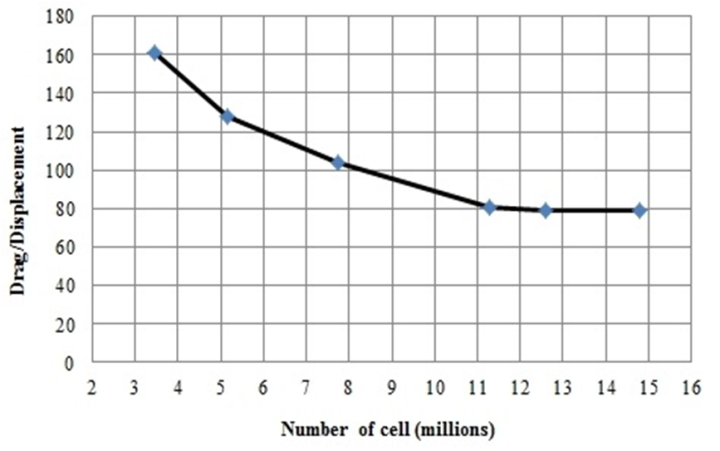 For example, the variation of drag force to displacement ratio based on number of cells Froude number of 1.85 is illustrated in Figure 4. 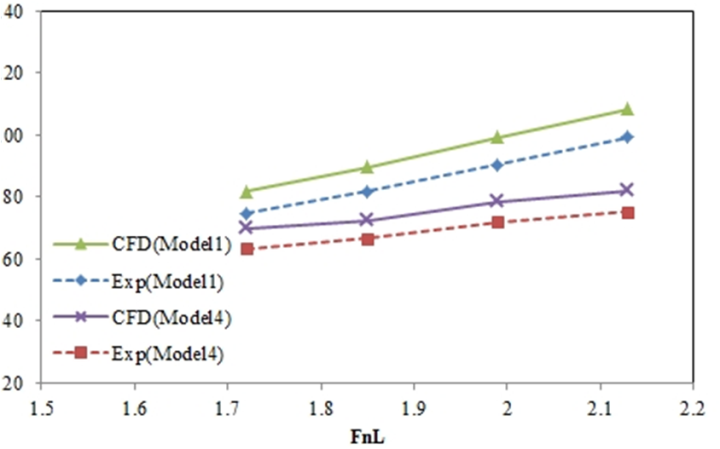 In this section, in order to validate the present numerical model, the numerical results obtained for different heights of steps are presented and compared with experimental data. The vessel model studied in this paper was tested in 2014 by Lee et al. for different heights of steps. The presented experimental results include the raise of center of mass, dynamic trim, and drag force. 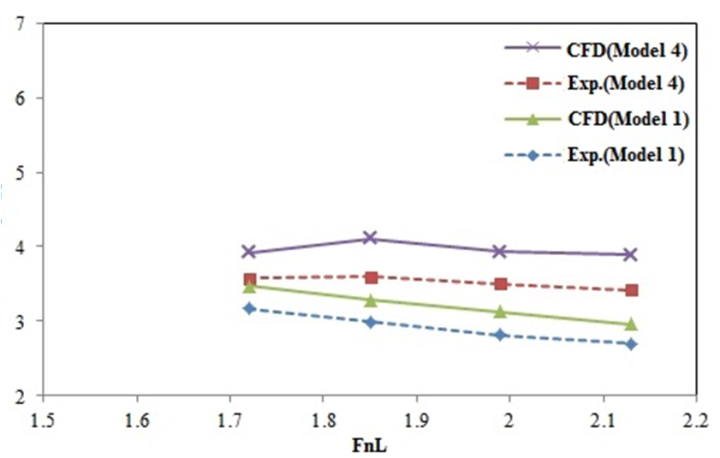 Comparison of the drag, trim and raise of CG is presented in Figure 5, Figure 6 and Figure 7, respectively. These results show relatively good agreement between numerical and experimental data. Figure 8 shows the pressure contour acted on the hull for different models at Fn=2.13. It can be observed that the model 1 that has the highest drag, achieves the lowest level of pressure peak. In contrast, the model 4 has the lowest drag and highest level of pressure peak. 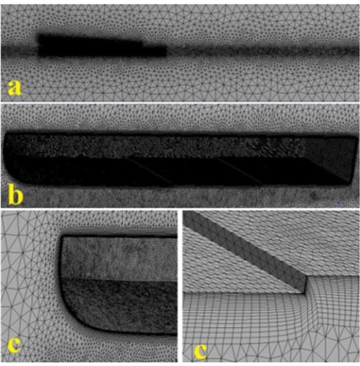 In this paper, the hydrodynamic effect of planing hull is numerically calculated. The hull has two transverse stepped with different heights. The solver software is ANSYS-CFD with the standard k-ε turbulence model. The numerical results are revealed the drag, trim, rise of CG and pressure distributions. Some of the results are compared with experimental data and found relatively good agreement between them. It is found that the effect may reduce drag and pressure distribution acted on the hull makes better ride and moderate performance. Effect of varying depth of step, angle of after body kell, length of after body chine, and Gross load; John R. Dawson, Robert Mckann, and Elizabeth S. Hay; Lagley Memorial Aeronautical Laboratory Langley Field, VA; July 1946. Savitsky, D., Hydrodynamic design of planing hulls, Marine Technology 1(1), 1964, 71-95. Savitsky D, DeLorme MF, Datla R., Inclusion of Whisker Spray Drag in Performance Prediction Method for High-Speed Planing Hulls, Maine Technology, Vol. 44, No. 1, 2007, pp. 35-56. 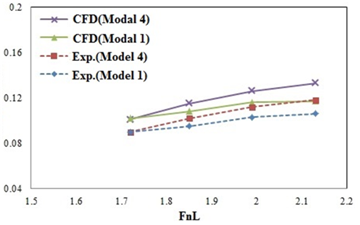 Brizzolara S, Serra F., Accuracy of CFD codes in the prediction of planing surfaces hydrodynamic characteristics. In: 2nd international conference on marine research and transportation, Naples, 2007. Ghassemi H, Ghiasi M., A combined method for the hydrodynamic characteristics of planing crafts. Ocean Eng 35(3-4): 2007, 310-322. Ghassemi H, Yumin S., Determining the hydrodynamic forces on a planing hull in steady motion. J Mar Sci Appl 7: 2008, 147-156. Kohansal AR, Ghassemi H, Ghiasi M., Hydrodynamic characteristics of high speed planing hulls, including trim effects, Turkish. J Eng Environ Sci 34: 2010, 1-16. Kohansal AR, Ghassemi H., A numerical modeling of hydrodynamic characteristics of various planing hull forms. Ocean Eng 37(5-6): 2010, 498-510. Akkerman I, Dunaway J, Kvandal J, Spinks J, Bazilevs Y (2012) Toward free-surface modeling of planing hulls: simulation of the Fridsma hull using ALE-VMS. Comput Mech 50(6):719-727. 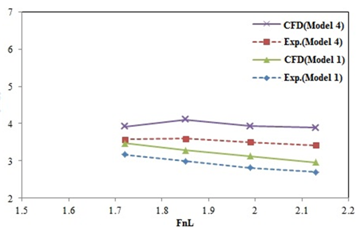 Yumin S, Qington C, Hailong S, Wei L., Numerical simulation of a planing hull at high speed. J Mar Sci Appl 11(2): 2012, 178-183. Ghassabzadeh M, Ghassemi H., Determining of the hydrodynamic forces on the multi-hull tunnel vessel in steady motion. Brazilian Soc Mech Sci Eng 36(4): 2014, 1-12. Mansoori M., Fernandes A.C., Ghassemi H., Interceptor design for optimum trim control and minimum resistance of planing boats, Applied Ocean Research, 69, 2017, 100-115. Taunton, D. J., Hudson, D. A., & Shenoi, R. A. Characteristics of a series of high speed hard chine planing hulls-part 1: performance in calm water. International Journal of Small Craft Technology, 152, 2010, 55-75. Matveev, K. I., Three-dimensional wave patterns in long air cavities on a horizontal plane. Ocean Engineering, 34(13), 2007, 1882-1891. Svahn D (2009) Performance prediction of hulls with transverse step. Master thesis, Marina System Center for Naval Architecture, KTH, Stockholm Taunton et al. Savitsky D, Morabito M., Surface wave contours associated with the forebody wake of stepped planing hulls. Mar Technol 47(1), 2010, 1-16. Taunton D, Hudson D, Shenoi R., Characteristics of a series of high speed hard chine planing hulls-Part 1: performance in calm water. Int J Small Craft Technol 152: 2010, 55-75. Garland WR, Maki KJA, Numerical study of a two-dimensional stepped planing surface. J Ship Prod Des 28(2): 2012, 60-72. 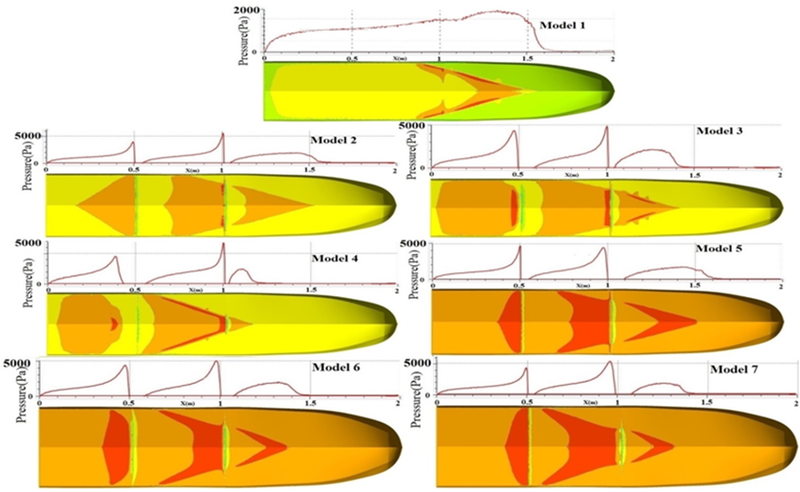 Ghassabzadeh M. and Ghassemi H., Numerical Hydrodynamic of Multihull Tunnel Vessel, Open Journal of Fluid Dynamics, Vol. 3 No. 3, 2013, pp. 198-204. Lee, E., Pavkov, M., & McCue-Weil, L., The systematic variation of step configuration and displacement for a double-step planing craft, Journal of Ship Production and Design, 30(2), 2014, 89-97. 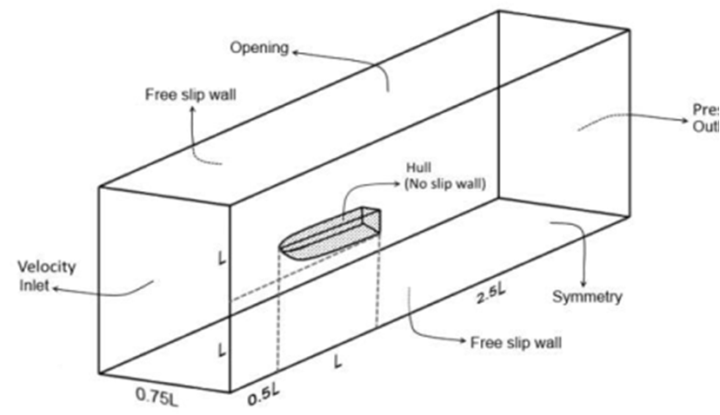 Bakhtiari M, Veysi S.T.G, Ghassemi H., Numerical modeling of the stepped planing hull in calm water. International Journal of Engineering; Transactions B: Applications Vol. 29, No. 2, 2016, 236-245. Nourghassemi, H., Bakhtiari, M., & Ghassemi, H. Numerical study of step forward swept angle effects on the hydrodynamic performance of a planing hull, Scientific Journals of the Maritime University of Szczecin, (51), 2017, 35-42. Nourghassemi, Hadi, Hassan Ghassemi, and Hamidreza Taghva. "Numerical Hydrodynamic Results of the Two Stepped Planing Hull." American Journal of Mechanical Engineering 6.3 (2018): 93-97. 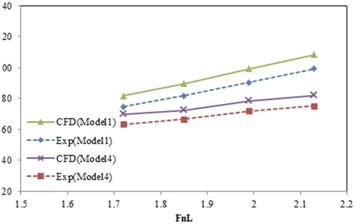 Nourghassemi, H. , Ghassemi, H. , & Taghva, H. (2018). Numerical Hydrodynamic Results of the Two Stepped Planing Hull. American Journal of Mechanical Engineering, 6(3), 93-97. Nourghassemi, Hadi, Hassan Ghassemi, and Hamidreza Taghva. "Numerical Hydrodynamic Results of the Two Stepped Planing Hull." American Journal of Mechanical Engineering 6, no. 3 (2018): 93-97.